The Siang and its tributaries abound in aquatic life. Mahsheer is common. Catches of 20-30 kgs are common and 100 kg is not unknown. Golden trout is found in the cold water of higher reaches. Angling festival will be organised at Bodak, at the junction of the rivers Siang and Yamne. The other popular angling site is at Boleng. One of the most prominent traditional dances, this dance-drama is performed during the “Loser” festival. There are five characters of mythological origin in this dance i.e. Gyeli, the chief protagonist, Nyapa & Nyaro, the antagonists and two female characters; Lhamu & Lhum.Lhamu was fairy from heaven that later became queen of Gyeli. This dance also depicts the marriage ceremony of Lhamu with king Chhoegay Norzang, represented by Gyeli. The Dukpa Tse-Shi Festival celebrated the preaching of the four Nobel Truths at Sarnath by Buddha. It falls in the 6th month of the Lunar calendar. Dree is the main Festival of the Apatanis. It is celebrated on the 5th of July after the planting of paddy. This dance signifies the fact that prosperity comes to this world when there is complete harmony and co-operation among the living things on the earth. According to the legend, which this dance depicts, a saint called “Tenteling” was meditating in the Himalayas continuously for years without food and water. Two snow lion living there were highly impressed with the saint and offered their milk for his survival and became his intimate friends. After completion of meditation, they all danced together with joy and happiness and the almighty showered all the prosperity in the area there-after. The people of Tawang continue to practice this dance on all the important occasions. The Losar festival is the beginning of the New Year according to the Monpa calendar. This 15- day festival falls in month of January / February. Its highlights are the colourful Aji Lhamu dance, Lion and Peacock dance and the Yak dance. Tawang Monastery is associated with the famous “Torgya” festival, celebrated in the eleventh month of local calendar for three days and the most enticing of the rituals are the dances. The festival is celebrated to drive away evil sprites so that the people may enjoy a happy and prosperous life in the coming year. Normally, a three-day affair, the monastic dance will be organized during Buddha Mahotsava festival to give the tourists an enthralling insight of the rituals of the believers of the sect. The monks of Tawang Monastery in beautifully designed constumes and colourful masks perform the dances. 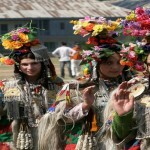 Mopin is an agricultural festival of the Galos celebrated on 5th April. Mopin is synonymous with wealth and prosperity. Nyukom festival of the Nyishis is celebrated on 28th February every year to propitiate the Gods for a good harvest. Oriah is an agricultural festival of the Wanchoos, celebrated on the 16th February. Festivities last for four to six days and are marked with songs and dance. Similar to Ponung but is performed on the occasion of Mopin, festival of the Galos. The dancers wear white dresses and elaborate headgear of straw. This dance of the Minyong group odd Adis is performed especially on the occasion of the Solung festival. The priest called Miri rattles an ancient sword and sings legends. Reh is celebrated by the ldu Mishmis on 1st February. Mithun, buffaloes, pigs and fowls are sacrificed in the name of different Gods and Deities. Solung is the colourful festival of the Adi-Minyong group. The festivities last for seven days and the villagers prepare rice beer and store plenty of meat and vegetables for the joyous occasion. Ser–Bang is an important religious ceremony of Buddhists in which a group of 21 monks in their complete attire walk in a procession to receive spiritual leaders. In Buddha – Mohatsava festival, Ser-Bang will be organized at the time of its formal inauguration to mark an auspicious beginning of the Mahotsava. The Torgya Festival is a 3-day affair. This important festival signifies the destruction of evil spirit and harmfulforces and seeks the rule of prosperity and happiness amongst the people. Dances have been an important part of life of the people of Tawang, perhaps a synonym for the every existence. A competition of traditional dances of the area will make the festival a real colorful one. A number of dances will be displayed in the competition. This entry was posted in Arunachal Pradesh, Arunachal Pradesh Fair & Festival, Festivals & Fairs and tagged Fair & Festival, indian festival list, indian festivals list, list of indian festivals. Bookmark the permalink.